Sligachan is a crossroads on the Isle of Skye, the main road runs north to south along the east coast. This remote main road dog legs around Loch Sligachan, the haunt of whales and dolphins. At the Campsite and Sligachan Hotel on the junction the road across the mountains to the west coast branches out, heading upwards and westwards though Glen Drynoch towards Dunvegan. The 18km, one way walk walk starts by crossing the bridge built by Thomas Telford and heading up the main path into Glen Sligachan. This starts off stoney but becomes boggy even in the dry summer sunshine. There are streams to cross, some with stepping-stones, others that need fording. The views all along the Glen are beautiful with the ominous Sgurr nan Gillean to the right and the more gentle and sun coated Red Hills and the crooked tip of Marsco to the left. After the boggy start the path dries out and eventually the dominant west face of Bla Bheinn comes into view. This sits to the east of a small loch - Loch an Athain which is the first of two lochs along the path. This has a stoney shoreline, perfect for dogs and children to paddle and skim stones. 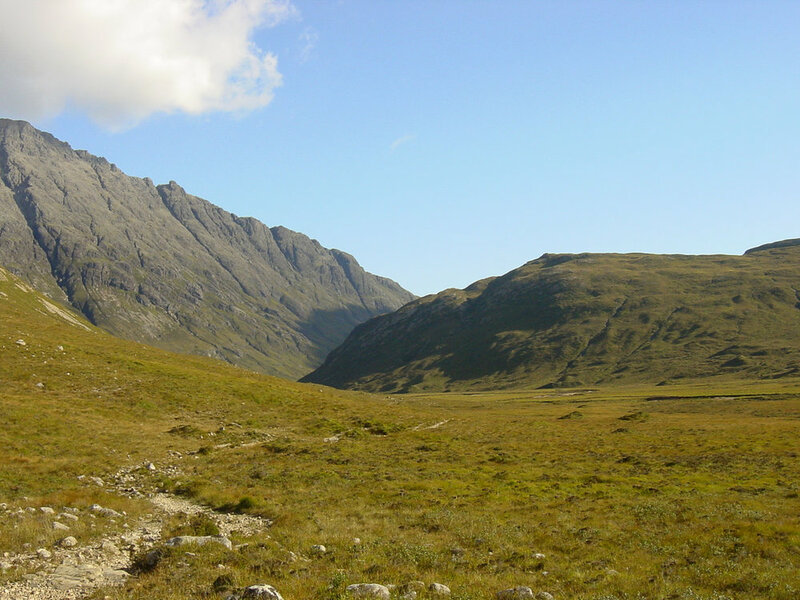 Keeping the dominant Bla Bheinn to the left, the lower path snakes through the lower edges of Bla Bheinn and Sgurr na stri to the west. After a short walk the larger loch - Loch na Creitheach comes in to view. Still and secluded with late afternoon shadows the pebble beach provides a perfect place to sit and watch the clouds skit above Bla Bheinn, reflected in the surface. Heading onwards the path narrows and passes the beautiful beach of Camasunary with the bothy which provides shelter when needed. From here the path continues to Elgol however a left turn heads over the hills towards Kirkibost passing the smaller peak of Ben Meabost. 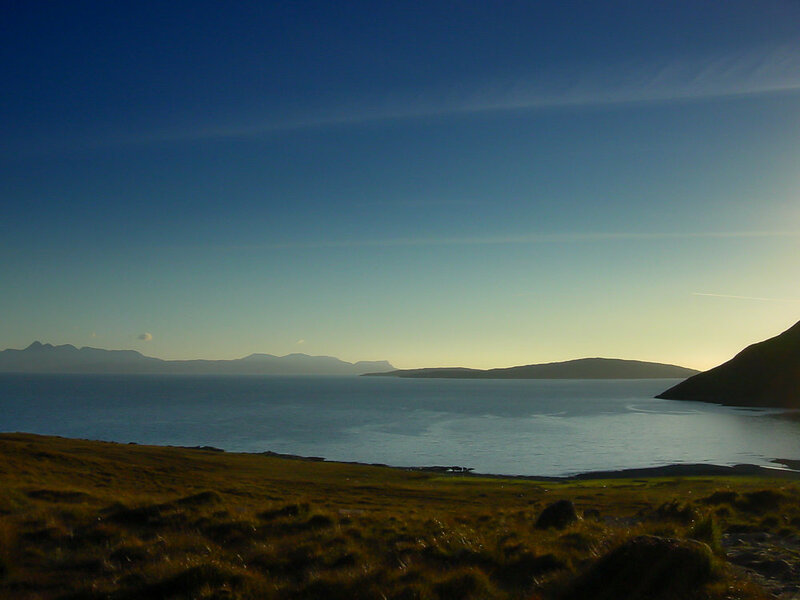 A final scramble to end the walk with amazing views across Loch Scavaig towards Soay with Canna, Rum and Eigg in the distance was the perfect end as the sun set over the Atlantic. All of these images were taken on film and later scanned. This walk is explained in detail on the Walk Highlands website with maps and a full description. It is flat, clearly marked with lots of fun for the kids along the way.